You'll be £30.00 closer to your next £10.00 credit when you purchase Figureheads of the Royal Navy. What's this? The first figureheads that were carved to represent the names of British warships appeared during the reign of Henry VIII; the last ones were carved in the early years of the twentieth century. During the intervening three hundred and fifty years it is estimated that some 5000 ships of the Royal Navy carried a figurehead of some description. This book follows the development of these diverse carvings, examining how the figurehead carvers interpreted the names and the symbolism incorporated in their designs. Evidence is drawn from a wide range of sources: contemporary ship models, ship plans, designs submitted for approval of the Navy Board and, of course, from those figureheads that have survived. Lavishly illustrated with much previously unpublished material, the book explores the wide range of subjects that were represented on the bows of Their Majesties’ Ships and recounts many of the stories that were told about them. The narrative is complemented by a catalogue that provides a brief description of each surviving figurehead, each carver’s design drawing with its source and reference number as well as those ship plans and contemporary models that show the figurehead’s detail. This combination makes the book useful to a wide range of historians, researchers and anyone with an interest in Britain’s maritime past. David Pulvertaft is a real admiral RN who has made the most comprehensive study yet of the figureheads of ships of the Royal Navy and has collated the information in this attractive book. The illustrations are, of course, the heart of this book and its raison d'etre. 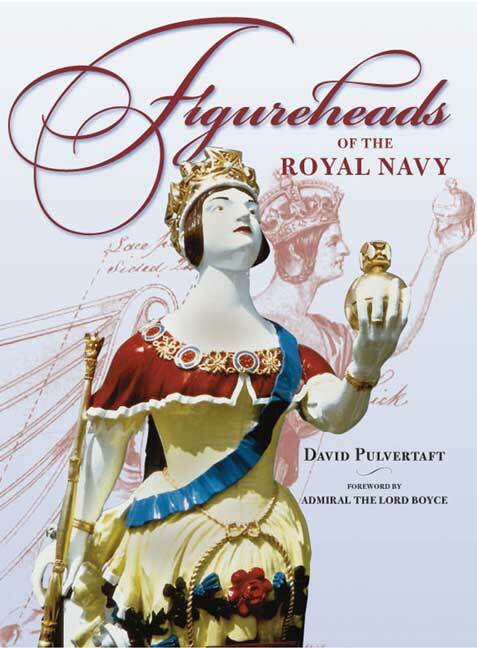 This book will undoubtedly become the standard reference for anyone who might need information on Royal Navy figureheads. It is also an attractive addition to anyone's naval bookshelf. The book is lavishly illustrated with over 300 photographs and original carvers' design drawings, most of which have not previously been published. The book is complemented by a Directory the provides a brief desciption and location of each surviving figurehead, each carver's design drawing with its source and reference number as well as those ship plans and contempory ship modelsthat show figurehead details . The book will thus be invaluable to historians and researchers and, indeed, to anyone with an interest in Britain's maritime past. 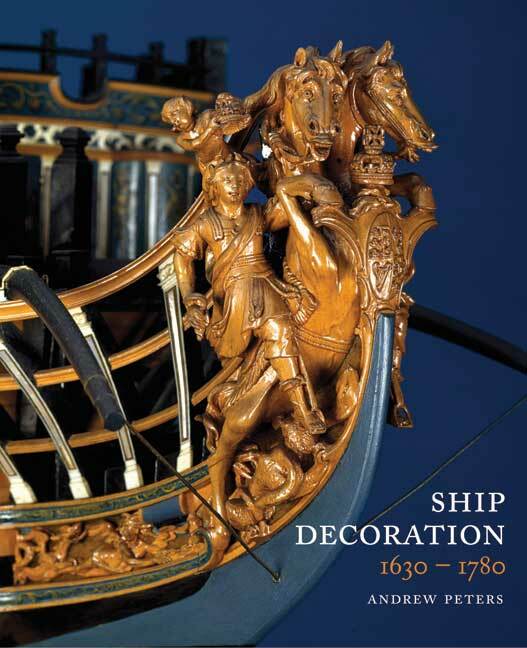 This excellent book provides a fascinating account of one of the most decorative and colourful adornments of the ships of the Royal Navy. This is a big subject and fortunately the book provides a splendid thirty-four page figurehead directory and it is amazing to see just how much information David Pulvertaft has researched and catalogued. The book is extremely well illustrated with photographs, sketches and design drawings. Most strongly recommended. Destined to be the body of work to be resourced when working in this field in the coming years. This is the first book to concentrate purely on Naval figureheads, the research is meticulous, and a great deal of thought has gone into its design and layout. This will be the classic reference work on the subject for years to come. The book takes us from the origins of the figurehead in the days of Henry VIII to the ending of this practice with the advance of the steam navy in the early 20th century. After looking at examples from the 16th-18th centuries, David also takes us in detail through the 19th century with specific examples of figureheads. Quite apart from the content of the book, the Figurehead Directory consists of 31 pages listing alphabetically all the approximately 200 examples of Royal Navy ship's figureheads. A detailed bibliography setting out the sources is also included together with a comprehensive index. DAVID PULVERTAFT, a retired rear admiral, started taking an active interest in warship figureheads while still serving in the Royal Navy and this book is the result of over twenty years of original research. 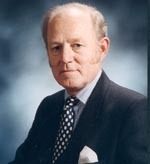 His previous book, the Warship Figureheads of Portsmouth, was published in 2009.